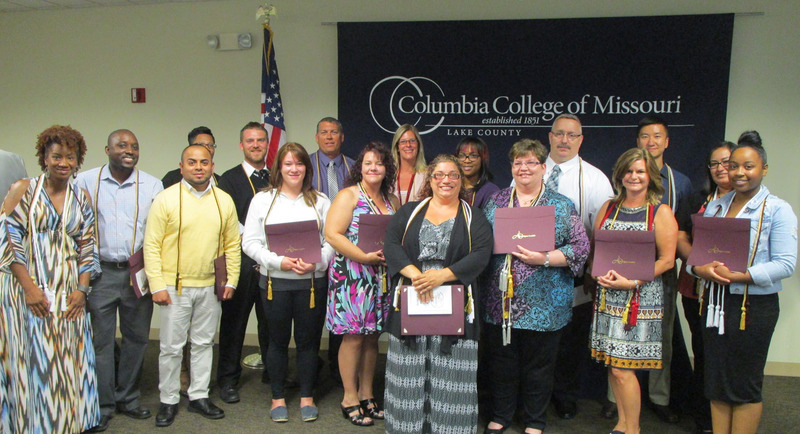 Students were inducted into four different honor societies at the Lake county campus on August 5 including Alpha Sigma Lambda, which recognizes the special achievements of adults who accomplish academic excellence while balancing competing interests between work and home. The purpose of Sigma Beta Delta is to encourage and recognize scholarship and achievement among students of business, management and administration. Sigma Beta Delta also encourages and promotes personal and professional improvement, and a life distinguished by honorable service to humankind. The aim of Alpha Sigma Lambda is to recognize the special achievements of adults who accomplish academic excellence while balancing competing interests between work and home. Tau Upsilon Alpha National Organization for Human Services is designed to honor academic excellence; to foster lifelong learning, leadership and development; and to promote excellence in service to humanity. Finally, Latin Honors recognizes academic excellence and to indicate the level of distinction with which an academic degree was earned. Latin Honors recipients have completed 60 credit hours in residency with Columbia College and have achieved the cumulative grade point average required for Latin Honors.